The gopher is a notorious rodent. No outdoor critter wreaks as much backyard havoc as the gopher. These underground creatures rose to fame alongside Bill Murray in Caddy Shack, earning them a reputation for stealth and elusiveness that could embarrass a CIA agent. Gophers are part of the Rodentia family and are destructive animals that live in burrows below the surface of the earth. Their niche is to dig extensive networks of subterranean tunnels, referred to as gopher towns, in a never-ending search of food, and for protection of other species. They construct their burrows by digging a main tunnel up to 18 inches below the ground and then excavating a series of lateral tunnels that branch off from the main one. This keeps gophers protected as they forage for food and raise their young. The end result of this constant digging causes destroyed landscapes and upset homeowners staring at their once beautiful lawns in sadness. Even though pocket gophers spend most of their time underground, the damage they leave behind is highly visible and displeasing to the eye. Their extensive burrowing and tunneling can ruin lawns, while their feeding habits can result in the destruction of your gardens and flowerbeds. 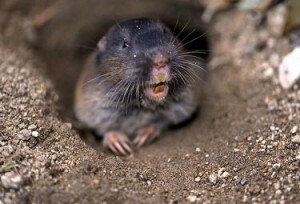 Gophers also excavate mounds of soil when they burrow, destroying your yard, and making your lawn unappealing. The pests sometimes damage water lines and sprinkler systems with their digging and gnawing, and their tunnels can disrupt the flow of irrigation water, which results in soil erosion. At MN Wild Animal Management Inc. we specialize in wildlife management control of burrowing rodents. We are flexible to work with and guarantee your problem will be handled immediately, no long waiting periods. We at MN Wild Animal Management Inc. have specific expertise about gophers and know how they construct their burrow systems. Therefore, we know where to locate their tunnels without ever digging up lawns or landscaping. Calling us means quick, flexible, affordable and easy to work with service. The service you need for today’s busy life. More than just our service you get our four year service warranty. We also understand you value your space and want to live in a clean environment, which is why we make it our priority to humanely remove wild animals from your home. Highly trained and knowledgeable, technicians know all about gopher removal and prevention in a humane way so give us a call at 763-232-7296.